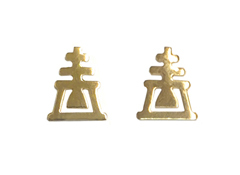 Our newest design is the small but mighty Raincross Mini, a subtle and affordable stud earring. One of our most intricate designs is the fabulous Star of Riverside, a beautiful celebration of Riversise and the Raincross. 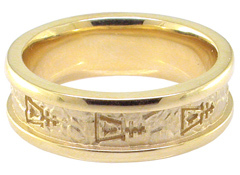 Our customizable Band Rings are perfect for anyone who loves the Raincross! The Filigree style has an old-fashioned look, using outline and negative space to show the Raincross in a unique fashion. 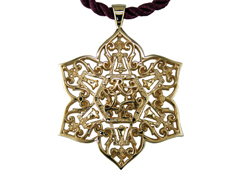 The Lavalier is a romantic, old-world style that can easily be customized with a gemstone of your choice. The Sunrise style is based on a cross that can be seen atop the southeast corner of the Mission Inn. Jim’s Special was originally a custom style, designed to be more durable and realistic. It turned out to be just what a number of people were looking for, and we now produce it regularly. The City Hall style is based on the Raincross that can be seen all over downtown Riverside.